White paper on crime 2004 Part2/Chapter6/Section3/1. 1. Assistance in investigation etc. If any evidence necessary for the investigation on a criminal case in Japan(including supplementary investigation for trial,hereinafter the same in this section)exists in a foreign country,Japan requests assistance in investigation by means of comity of nations through diplomatic channels for foreign countries with which another route has not been established through treaties on assistance.If Japan is requested by a foreign country to provide evidence necessary for the investigation of a criminal case,Japan provides assistance in investigation in accordance with the requirements and procedures provided in the Law for International Assistance in Investigation etc. (Law No.69of1980)under the guarantee of reciprocity,even to foreign countries that have not concluded treaties on assistance with Japan. The Law for International Assistance in Investigation,which came into force in October1980,was renamed to the Law for International Assistance in Investigation etc.through the law to revise part of the Law for International Assistance in Investigation and the law concerning punishment of organized crimes and restrictions on criminal proceeds,which was promulgated on June9,2004(Law No.89of2004,enforced in June,and partly in December,2004).Japan had not concluded any bilateral treaty with any foreign country,but for the purpose of further strengthening cooperation for assistance in investigation,it negotiated toward the conclusion of a treaty with the United States since1999,which resulted in the signing of the Treaty between Japan and the United States of America on Mutual Legal Assistance in Criminal Matters(hereinafter referred to as the"Japan-U.S.Criminal Assistance Treaty")in August2003.The conclusion of the treaty was approved by the Diet in May2004. Under this treaty,implementation of assistance is defined as a legal obligation,and provisions were made that are designed to ensure that assistance will be promptly and surely provided,such as provisions for sending and receiving requests for assistance through the predetermined"central authorities"instead of through the diplomatic channels,and relaxing of the conditions for providing assistance to a certain extent.The Law for International Assistance in Investigation before revision contained no provisions for cases where assistance is requested under the treaty,but the Law after revision made provisions to introduce legislation toward conclusion of the Japan-U.S.Criminal Assistance Treaty and to facilitate the smooth implementation of assistance.It also serves as preparation for the future conclusion of similar treaties with other foreign countries. Under the multilateral treaties that have recently been developed to deal with transnational crimes,it is provided that the Contracting States shall provide one another with the maximum assistance in investigation,prosecution and judicial proceedings on certain offenses that are stipulated in the treaties.With the aim of achieving more effective assistance,bilateral treaties often include provisions concerning the designation of the"central authorities"("U.N.Convention against Transnational Organized Crime"etc.referred to in Section1of this chapter). When requesting assistance from a foreign country in collecting evidence necessary for the investigation of a criminal case in Japan,the public prosecutors office or the police etc.makes such request through the diplomatic channels. When the public prosecutors office makes a request for assistance,the request is generally referred to the Ministry of Justice,the Ministry of Foreign Affairs,the Japanese diplomatic establishments in the foreign country,and finally to the Ministry of Foreign Affairs of the foreign country.In the case of a request made by the police,it is referred from the prefectural police to the National Police Agency,the Ministry of Foreign Affairs,the Japanese diplomatic establishments in the foreign country,and finally to the Ministry of Foreign Affairs of the foreign country.Such request is handled by the juridical authorities etc.of the foreign country to which the request was made. Under the Japan-U.S.Criminal Assistance Treaty,the"central authorities"system is adopted.Therefore,after the enforcement of the treaty,the Ministry of Justice and the National Police Agency of Japan will be able to send requests for assistance directly to the Justice Department without using the diplomatic channels. Another way of seeking cooperation from foreign countries such as the provision of information and materials necessary for the investigation of criminal cases is the use of the International Criminal Police Organization(ICPO).In this case,a request for cooperation made by a prefectural police is generally referred to the National Police Agency,which is the national central bureau of the ICPO in Japan,and then sent to and handled by the police of foreign countries that are ICPO members. Fig. 2-6-3-1 shows the trend of requests for international assistance in investigation over the last10years. Over the last10years,a total of169requests were made by public prosecutors offices for assistance in investigation to27foreign countries(regions)through diplomatic channels(Source:Data by Criminal Affairs Bureau,Ministry of Justice). By the police,24requests for assistance in investigation to foreign countries were made in2001,15in2002,and10in2003(Source:Data by Criminal Investigation Bureau,National Police Agency). (3) Request from foreign countries to Japan for assistance in investigation etc. The Law for International Assistance in Investigation etc.provides the procedures to be followed in the case of receiving a request from a foreign country to provide evidence and in the case of receiving a request from the ICPO for cooperation. Fig. 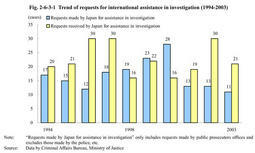 2-6-3-1 also shows the trend of requests from foreign countries to Japan for assistance in investigation over the last10years.A total of225requests from33foreign countries(including regions)were received by Japan(Source:Data by Criminal Affairs Bureau,Ministry of Justice). After the enforcement of the Japan-U.S.Criminal Assistance Treaty,the U.S.Justice Department will send requests for assistance directly to the Ministry of Justice of Japan without using the diplomatic channels.